CDPs. DMPs. SCVs. Marketers swim in a sea of acronyms and the confusion surrounding them is muddying the waters. When building your marketing technology stack, do you need a Customer Data Platform, a Single Customer View, a Data Management Platform – or all three? In this webinar, Jim Kelly, Principal Consultant at BlueVenn will guide you through these troubled waters so you can set a course for more successful marketing in 2017. Despite the widespread popularity of the term Customer Data Platform, multi-channel organizations have, in reality, been attempting to create a Single Customer View ever since the dawn of database marketing. In this webinar - To CDP or Not to CDP?, we’ll look at five different methods that organizations invest in to unify their data, from working with marketing solution providers or data bureaus to an investment in a “marketer-controlled” Customer Data Platform. Our research across 3000 consumers found that 9 out of 10 are willing to pay more for a better customer experience, and with predictive analytics, you can deliver this personalized experience on a large scale - but how? In this session we will look at the important, but less glamorous, aspect of predictive analytics – the data. We’ll explore the power of CDPs to provide the foundation for predictive modelling and look at some multi-channel retail examples of predictive models that can reinforce customer loyalty and increase purchase probability. 1)Do you use predictive models in your marketing campaigns? 2)If yes, how effective are you finding predictive analytics? 3)What question would you like to post to the presenter Matt? (3) Evolution of the marketing database and rise of Customer Data Platforms. Grab your notepad and pen and join us for this monster of a session! 1) Do you have a CDP, Single Customer View or Data Warehouse? 2) If yes, is it owned by marketing or IT? 3) What question would you like to post to the presenter Jim? Customers navigate and meander around brands and their products in ways that were unthinkable 20 years ago. However, marketers are still stuck in a linear campaign mindset, with linear batch and blast marketing tools. In this webinar we'll take you through some groundbreaking principals that will help to set the building blocks in your organization to transition to an optimized, always-on and omnichannel approach to your campaigns and customer journeys. - The vital need to create the "Golden Record"
Get your notepad at the ready! You’re going to be getting some fantastic insights on this session! Multi-channel marketing departments across the world undergo constant struggles in their attempts to effectively unify all their data to create a Single Customer View. Ultimately, the aim is to fuse together online and offline data to piece together an often fragmented view of every customer that hinders personalization tactics and leads to misdirected campaigns and marketing offers. In this webinar we’ll take you through the process that a Customer Data Platform automates for marketers to unify, standardise, transform and de-duplicate data from infinite sources, and will detail the benefits of a CDP brings for trustworthy analytics, segmentation and more targeted personalisation strategies across all your marketing channels. Buying a new vehicle can be a personal and significant purchase. Often starting with an aspirational poster on a bedroom wall, the car-buying journey is one that could take weeks, if not years. That’s why delivering the most relevance and tapping into those emotions is so important for automotive marketers. BlueVenn Consultant Director Jeremy Bender will discuss how IM Group, distributors for Subaru, use pioneering personalization approaches to deliver marketing content to the right person at the most opportune moments to see automotive dreams become reality. How do we deliver highly consistent and relevant multi-channel experiences for our customers? How do Customer Data Platforms optimize multi-channel marketing? In this 45 minute webinar you’ll learn how to use a 360 degree view of your customer data for better multichannel insights, more effective predictive analytics and to execute perfectly targeted, channel-optimized customer journeys. customer insight and optimize campaign performance through a Single Customer View of offline and online data. With a New Year comes new challenges, new data to understand, new laws to consider, and emerging technology trends. How do you keep your head above the water and ride the waves of change? For example, do you understand how a Customer Data Platform (CDP) uses a Single Customer View? Do you know how a CDP benefits from a layer of multi-channel campaign management? How best to manage complex customer journeys - and make the most effective and efficient use of your customer data? During this webinar, Matt Dimond, Consultant at BlueVenn, helps you cut through the noise to highlight how to enhance your customers relationships, by understanding which operational approaches best enable the convergence between technology and rich, personalized customer interactions. Customers use multiple devices across many online and offline channels, generating overwhelming amounts of data. Organizations and marketers don’t only have to pull all this data together and make sense of it, but use it to deliver a seamless and personalized journey across every channel. While a CDP to create a Single Customer View can help you triumph over disparate data, the battle is only half won: these persistent, unified records need to be put to use. With multi-channel campaign management, marketers have the ability to engage and communicate with their customers at every stage of their journey. 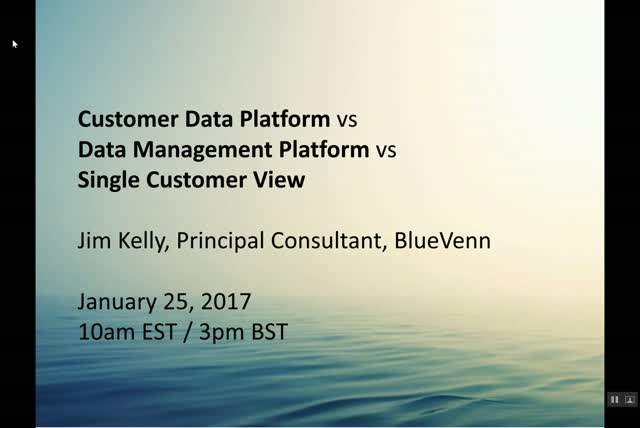 During this webinar, Customer Data Platform Institute founder David Raab and Jim Kelly, Principal Consultant at BlueVenn, will discuss how a holistic view and a consistent customer experience creates more relevant marketing. Asking questions such as: How else do the two marketing technologies benefit each other? Can one work without the other? Plus, of course, why a CDP and multi-channel campaign Management is a Match Made in Heaven. Predictive analytics can be a great way to uncover historical trends in your customer’s transactions and behaviors to help better predict what they will do or buy next. Retailers have been using this approach for many years but now with AI and machine learning on the way back, this webinar will look at predictive modelling, how it can be applied to lifetime value and RFV and the importance of giving your predictive models attention when trying to scale as a business. This webinar will be delivered by Mark Jameson, Chief Operating Officer at BlueVenn, who will show examples of customer segmentation using predictive models and how to use these to improve the success of your marketing campaigns. Identity Resolution is at the forefront of database marketing in 2017 as brands look to connect disparate data sources and data types to build a unique profile of each customer. The possibilities of linking online and offline data, optimizing the use of 1st, 2nd and 3rd party data, cookies and social ids, alongside the traditional single customer view, has the potential to change the way we interact with customers. The marketing potential for connecting offline and online, martech with adtech, known and unknown is proving limitless. But how and where do you begin? This webinar examines the common misconceptions and questions surrounding starting a SCV project. Jim Kelly, Principal Consultant at BlueVenn, takes you through the benefits, technicalities, improvements and ROI that an SCV could bring your organization. Having consulted for some of the biggest names in the retail, leisure, finance and insurance industries, Jim provides an honest and fair representation of the benefits and complexities of building an SCV. Each customer undertakes a unique journey, incorporating multiple channels and exhibiting different behaviors. Although this means huge potential for marketers to better engage with customers, actually tracking this behavior, and making use of the data, can seem like an insurmountable challenge for marketers. In this webinar, BlueVenn Principal Consultant Jim Kelly will explore this topic in more detail and discuss concepts such as ‘cross-journey communication’ to manage the customer experience. The impending GDPR changes will bring to the forefront two ‘big concepts’ to the marketing world – Accountability and Data Governance. In this webinar we will explore how marketers can look at GDPR as a positive advantage. You’ll learn how to potentially use these ‘big concepts’ to both increase consumer trust and start to build a true business asset from your customer data. The GDPR is due to kick in from May 2018 and whilst you may have heard about impending fines and risks to your use of customer data we have teamed up with Alexandra Leonidou, Privacy and Data Protection expert at leading Law Firm Foot Anstey to provide insight into the positive changes that you can bring about through the enforced changes. 1) Know how to comply with GDPR in practical terms. 2) Find out how GDPR can bring about improved consumer trust, increased confidence in ‘marketing data’ and streamlined processes. How many hours do your sales and marketing teams waste on “Tyre Kicker” prospects that never buy anything?! Blue Sheep has found that organisations waste 80% of their total time chasing prospects that contribute 15-20% of the revenue and just 20% of their time on clients that provide 60-80%. The issue happens time and again where a business is not able to identify these ‘Tyre Kickers’ early enough in the marketing-sales cycle. Using customer insight and a unique process called ‘Money Mapping’, Jemma Hardyman – lead consultant for the Blue Sheep Data Services team – will discuss how all B2B organisations can utilize simple analytics and segmentation techniques to ensure you devote your marketing and sales efforts on the right prospects that are going to spend big and stay longer! This webinar is run by Blue Sheep, a BlueVenn partner. ‘Data Marketing maturity’ can mean a different thing for different organizations but is an essential requirement for all marketing departments in the fast changing world we’re in. Data is never going to get smaller yet many organisations are being left behind not realizing that they need to upskill before it’s too late. For SMB marketing departments utilizing email marketing this could be a step towards analytics and segmentation, for enterprise organizations this could be consolidation of data sources, across multiple brands, to create a Single Customer View. Or perhaps it’s the big plunge into Big Data, Programmatic or Machine Learning. Whatever the steps are towards ‘data marketing maturity’ there will always be a requirement for new skills, new technology and a requirement for change and learning new processes. In this webinar, BlueVenn Consultant Pedro Rego will talk through the top five techniques necessary for marketing maturity success, including examples of those who are using these capabilities, and the ROI of executing them successfully. This webinar gives you an understanding of the fundamental processes and elements you need to consider when undertaking a transformation of your internal marketing capabilities. The quintuple combination of people, culture, data, technology and process will all be discussed and we’ll arm you with everything you need to be able to initiate a new project within the business. As well as giving you the knowledge for change, Jim Kelly, Principal Consultant at BlueVenn will also provide tips for creating your vision to help you get to where you want to be. Consumers are statistics, customers are people. Gone are the days of mass marketing. Technology and data can now combine real-time marketing, online personalization and triggered customer journeys with a Single Customer View (SCV) and your existing analytics, empowering marketers to achieve customer-centric marketing in a hyperconnected world. A deeper understanding of the customer journey is changing the way organizations engage with their customers, meaning brands who adopt customer journey optimization strategies are reaping the benefits. The problem is, each customer undertakes a unique journey, incorporating multiple channels and exhibiting different behaviors. Although this means huge potential for engagement, tracking this behavior and making use of the data can seem like an insurmountable challenge. As marketers, we need to move past the old metrics and campaigns that have no relevance in the new age of the customer and look at new ways to monitor cost, measure response, attribute impact and improve communications. BlueVenn is the first and only Customer Data Platform with fully integrated Multi-Channel Marketing Automation, providing the marketing teams at over 400 organizations worldwide with access to a 360 view of their data, predictive analytics and multi-channel marketing automation. We run regular educational webinars on topics such as Single Customer View, Personalization, Real-time Marketing, Customer Analytics, Multi-Channel Marketing.